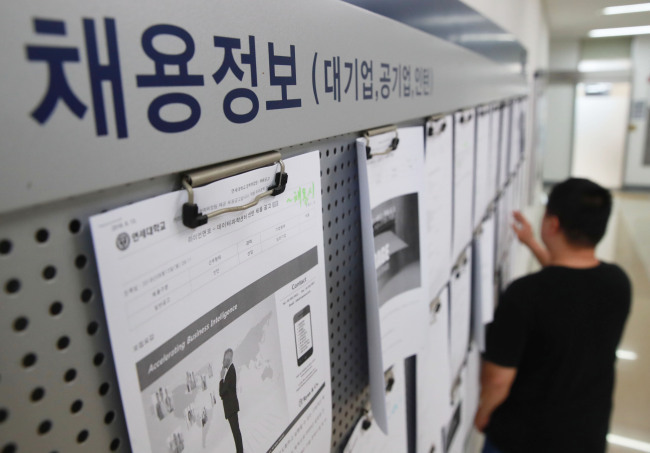 Korea's unemployment rate rose slightly in July due to fewer positions in the health care, education academy and manufacturing sectors, with the number of new jobs created hitting the lowest in over eight years, government data showed Friday. The unemployment rate stood at 3.7 percent last month, up 0.3 percentage point from a year earlier, according to the report compiled by Statistics Korea. The number of employed people reached 27.08 million in July, up just 5,000 from the same one-month period in 2017, the smallest gain since January 2010, according to the data. The unemployment rate for young adults -- those aged between 15 and 29 -- was 9.3 percent, unchanged from the previous year. The employment rate stood at 67 percent in July, down 0.2 from a year earlier, with the corresponding figure for young people at 43.6 percent, up 0.2 percentage point over the cited period. The number of newly added jobs has stayed slightly above 100,000 per month over the past sixth months. The manufacturing sector shed 127,000 jobs last month, marking a decline for a fourth straight month. The education service sector also saw its employment drop to 78,000 last month. "The structural changes in some industrial sectors contributed to a drop in job additions," an official at Statistics Korea said. "The biggest factor is that corporate restructuring in the manufacturing sector is affecting the overall employment." Last month, the government cut its job creation target to 180,000 this year from 320,000. Since May, the government has been implementing a 3.9 trillion-won (US$3.69 billion) extra budget largely to create jobs for young people amid deepening concerns about high unemployment, which the government warned would have catastrophic consequences. The government hopes that with the pledged support, youth unemployment could fall below 8 percent by 2021 and upwards of 220,000 jobs could be added annually through 2021. Seoul's push comes as President Moon Jae-in has called for all-out efforts to create quality jobs for young people and warned that the high jobless numbers among young adults is a national disaster.